We are pleased to present this delightful recipe by Kelly Lowes. Rejoice in the wonder of what you can create this summer. Note: This recipe will not work unless the ripe strawberries are freshly frozen, thawed with the juice. Place the strawberries into a bowl. Add all of the remaining ingredients to the bowl except the psyllium husks. Take some food handling gloves and mix the strawberries and other ingredients. Break up ¾ of the whole strawberries by hand while mixing. Add the psyllium husks and hand mix those in. Cover the bowl and place it into the refrigerator overnight for 8 hours. Place the coconut meat, coconut milk, salt, lemon juice, maple syrup, vanilla extract, and strawberry extract into a Vitamix. Blend until creamy smooth. Test it for smoothness with your fingers. Turn the Vitamix on low and slowly add the melted coconut oil. Use the tamper to blend the oil completely in. Add the lecithin to the Vitamix using the same procedure. Make sure it is evenly mixed in. Take a bowl and pour a layer of coconut crème into it. Sprinkle some strawberry powder onto the layer. Swirl it into the layer without completely mixing it in. Repeat the procedure for all of the layers of crème. Keep going until you run out of crème and strawberry powder. Cover the bowl and set into the refrigerator for 8 hours. Place the mulberries onto a dehydrator tray without a teflex sheet. Dehydrate them at 115 degrees for 8 to 10 hours. Place all of the ingredients into a medium sized bowl. Mix them all together. Place the mixture on a dehydrator tray with a teflex sheet. Make sure the almonds are joined together like a brittle. Do not spread them out too thinly. You will need to break them apart for the garnish later. Place the tray into the dehydrator at 115 degrees for 5 hours. Remove them from the dehydrator and turn them over onto another dehydrator tray with a teflex sheet. Continue dehydrating for another 4 to 5 hours. Place the water, sesame oil, honey, salt, and lemon juice in a Vitamix. Blend until evenly distributed. Add the psyllium husk and blend that in. Let sit on the counter for 5 minutes. Place the oat flour and ground almonds into a large mixing bowl and mix together. Pour the contents of the Vitamix into the bowl and mix by hand until evenly distributed. Roll into a ball. Take a teflex sheet and place it on the counter. Sprinkle the sheet with flour. Place the crust onto the teflex sheet. Cut ½ of the crust away. Set aside. Place a teflex sheet over the remaining crust so that it is between two teflex sheets. Take a rolling pin and roll it out flat to 1/8” thick. For detailed directions on creating the pastry casing, assembly, and decoration, follow the video. This recipe makes 25 cookies and one round pastry. We are seeking a person of spirit: wholehearted and enthusiastic. Someone with first hand experience in sales and marketing of alive, organic and kosher food. Our office is located in lively north Berkeley. Awaken to the snap, crackle and pop of quinoa puffs, the luxuriance of blueberry and the delight of alive cacao! Rouse your creative energies! We invite you to celebrate vitality! Start your day organically with quinoa, almonds, chocolate, Medjool dates, sundried raisins, cranberries, blueberries, flaxseeds, and chocolate blended with Kona Gold Wilelaiki Blossom Honey. (Natural News) There’s a very simple way to manage your blood sugar levels. It’s so easy you can do it while sitting, watching TV, or reading a book: munching on almonds. These flexible and nutrition-packed nuts are known to have awesome medicinal value and one of the diseases they can help treat is diabetes. 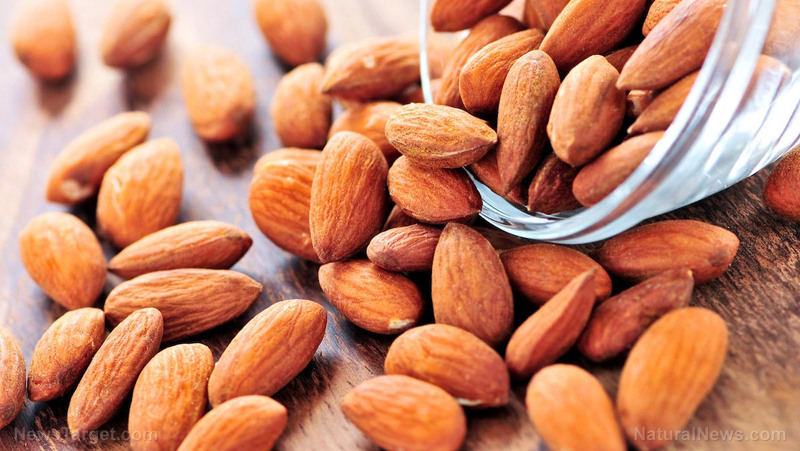 Research has shown that almonds can help regulate blood sugar levels, blood pressure, and blood fats – three important factors that affect diabetes. Snacking on these can help stave off type-2 diabetes and other diseases like cancer and cardiovascular illnesses. Type-2 diabetes (also called non-insulin-dependent) stems from the body’s ineffective use of insulin. This affects millions of people globally and is largely the result of physical inactivity and excess body weight. While its symptoms are similar to type-1 diabetes, they are often less marked. This could mean that the condition can be diagnosed only when the complications manifest themselves. Interestingly, type-2 diabetes used to be common only in adults but there’s now an increasing frequency in children. (Buffalo Field Campaign) Buffalo Field Campaign is seeking volunteers for our summer outreach program. Volunteers get to spend five days a week camping in beautiful Yellowstone National Park. You’ll spend your days enjoying all that the landscape has to offer, from relaxing in the Boiling River to watching a mama black bear with her cubs. You’ll have the amazing opportunity of seeing wild buffalo during the rut, while helping to do outreach on their behalf. Educating park visitors on the plight of America’s last wild bison is one of the most important parts of what we do here at Buffalo Field Campaign. While tabling you’ll meet and bring the buffalo’s story to people from all over the world. During the five days in the Park, volunteers will share a tent at various campgrounds in and around Yellowstone. When not tabling, adventuring in the park is one of the many benefits of summers in Yellowstone, with plenty of places to hike, swim, and enjoy nature. Volunteers will have two days a week at BFC headquarters near West Yellowstone.